This research summary comes from, CSGlobe: Expand Your Consciousness.The original research article is from Experimental Brain Research, August, 2013 issue. Researchers found that psilocybin can stimulate hippocampal neurogenesis and extinguish conditioned fear responses, making it an ideal treatment for post-traumatic stress disorder. Importantly, even small doses not likely to be fully "psychedelic" show these outcomes. 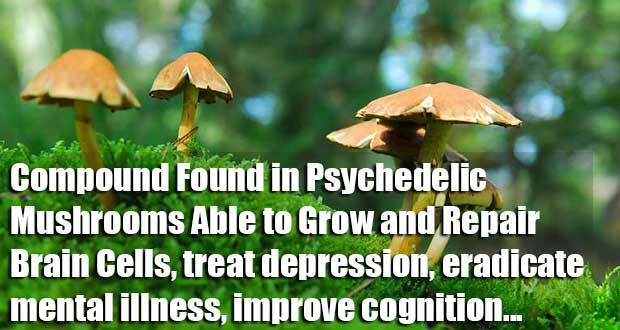 You may know them as “shrooms”, “Magic mushrooms”, psilocybin mushrooms, or you may not know them at all. They are a natural “plant” [fungi] that, like marijuana, is banned by the U.S. Government. But like marijuana, these mushrooms may not be without medical properties. Like marijuana, they could deserve a place on natural medicine shelves for their ability to treat depression, eradicate mental illness, and improve cognition – not in police evidence rooms. CSG has written various articles about ‘Mushrooms.’ You can view some of them below. For more CSG articles related to ‘Mushrooms’, click here. Here is the abstract from the original article, with the full article [almost] hidden behind a paywall. Please note that the text does not contain accurate presentations of some nomenclature, specifically for the 5-HT molecules, which should have a suffix of 1a, 2a, 2c, or 1d presented as a subtext. Catlow BJ, Song S, Paredes DA, Kirstein CL, Sanchez-Ramos J. Drugs that modulate serotonin (5-HT) synaptic concentrations impact neurogenesis and hippocampal (HPC)-dependent learning. The primary objective is to determine the extent to which psilocybin (PSOP) modulates neurogenesis and thereby affects acquisition and extinction of HPC-dependent trace fear conditioning. PSOP, the 5-HT2A agonist 25I-NBMeO and the 5-HT2A/C antagonist ketanserin were administered via an acute intraperitoneal injection to mice. Trace fear conditioning was measured as the amount of time spent immobile in the presence of the conditioned stimulus (CS, auditory tone), trace (silent interval) and post-trace interval over 10 trials. Extinction was determined by the number of trials required to resume mobility during CS, trace and post-trace when the shock was not delivered. Neurogenesis was determined by unbiased counts of cells in the dentate gyrus of the HPC birth-dated with BrdU co-expressing a neuronal marker. Mice treated with a range of doses of PSOP acquired a robust conditioned fear response. Mice injected with low doses of PSOP extinguished cued fear conditioning significantly more rapidly than high-dose PSOP or saline-treated mice. Injection of PSOP, 25I-NBMeO or ketanserin resulted in significant dose-dependent decreases in number of newborn neurons in hippocampus. At the low doses of PSOP that enhanced extinction, neurogenesis was not decreased, but rather tended toward an increase. Extinction of "fear conditioning" may be mediated by actions of the drugs at sites other than hippocampus such as the amygdala, which is known to mediate the perception of fear. Another caveat is that PSOP is not purely selective for 5-HT2A receptors. PSOP facilitates extinction of the classically conditioned fear response, and this, and similar agents, should be explored as potential treatments for post-traumatic stress disorder and related conditions. Of course, paywalls sometimes can be climbed over and otherwise circumvented. Thus I present you with the Introduction and the Discussion for the study at hand. Psilocybin (4-phosphoryloxy-N,N-dimethyltryptamine, PSOP) was first isolated from Psilocybe mexicana, a mushroom from Central America by Albert Hofmann in 1957 and soon after produced synthetically in 1958 (Hofmann et al. 1958a, b). PSOP is an indole hallucinogen with potential clinical applications in the treatment for anxiety disorders, obsessive–compulsive disorder, major depression and cluster headaches (Moreno et al. 2006; Grob et al. 2011; Young 2013). PSOP is dephosphorylated in the body and converted into the active metabolite psilocin (4-hydroxy-N,N-dimethyltryptamine) which exerts psychoactive effects by altering neurotransmission through serotonin (5-HT) receptors 5-HT1A, 5-HT1D, 5-HT2A and 5-HT2C, but binds to 5-HT2A receptors with high affinity (Ki=6 nM) (McKenna et al. 1990; Passie et al. 2002). 5-HT2A receptors are highly expressed throughout the hippocampus (HPC) in the dentate gyrus (DG), hilus, cornu ammonis (CA) 1 and CA3 and are co-localized on GABAergic neurons, pyramidal and granular cells (Luttgen et al. 2004; Morilak et al. 1993, 1994; Pompeiano et al. 1994; Shen and Andrade 1998; Cornea-Hebert et al. 1999). 5-HT2A receptor down regulation is thought to be an adaptive process triggered by chronic administration of selective 5-HT uptake inhibitors (SSRIs) (Eison and Mullins 1996). Antidepressant medications which elevate 5-HT over prolonged periods such as SSRIs have been shown to enhance hippocampal neurogenesis (Malberg et al. 2000). Neurogenesis occurs throughout the life span in the adult brain, the subventricular zone (SVZ) and the subgranular zone (SGZ) in the DG (Altman 1962, 1969; Altman and Das 1965). The proliferation and survival of neural progenitors in the adult HPC can be influenced by a variety of stimuli including stress, age, drugs of abuse, physical activity and depression (Malberg et al. 2000; Van et al. 1999; Kempermann et al. 1998; Gould et al. 1992). The involvement of 5-HT in the regulation of neurogenesis may be mediated through different 5-HT receptor subtypes expressed on cells in the neurogenic microniche (Barnes and Sharp 1999). Serotonin activates fifteen known receptors, many of which are expressed in the DG (Tecott et al. 1993; Vilaro et al. 1996; Djavadian et al. 1999; Clemett et al. 2000; Kinsey et al. 2001). Acute activation of the 5-HT1 receptor has been shown to increase cell proliferation in the DG, whereas repeated inhibition of the receptor results in diminished neurogenesis (Klempin et al. 2010). Interestingly, both acute and repeated stimulation of the 5-HT2 receptor attenuate proliferation and neuronal survival (Klempin et al. 2010). Studies investigating the effects of 5-HT2 receptor subunits on proliferation and neurogenesis in the DG have found that acute activation of the 5-HT2A/C receptor via 2,5-dimethoxy-4-iodoamphetamine (DOI), the 5-HT2C receptor agonist RO 600175 or the 5-HT2C receptor antagonist SB-206553 had no effect on cell proliferation, whereas the 5-HT2A/C receptor antagonist ketanserin produced a 63 % decrease in BrdU incorporation (Banasr et al. 2004). Similarly, other investigators reported that acute ketanserin decreased proliferation, but chronic ketanserin increased proliferation in the DG (Jha et al. 2008). Additionally, no effect on proliferation was observed after DOI or lysergic acid diethylamide (LSD) was administered either acutely or once daily for seven consecutive days (chronic) (Jha et al. 2008). Administering LSD and PSOP by giving daily doses has been shown to produce rapid tolerance to the drug and results in a selective downregulation of the 5-HT2A receptor (Buckholtz et al. 1985, 1990). The serotonergic system has been implicated in hippocampal (HPC)-dependent learning. Administration of SSRIs produces alterations in performance on learning tasks that require the HPC (Flood and Cherkin 1987; Huang et al. 2004). In a knockout (KO) mouse model, central 5-HT–deficient mice developed heightened contextual fear conditioning which was reversed by intracerebroventricular microinjection of 5-HT (Dai et al. 2008). An impairment in learning on the Morris water maze was observed in 5-HT1A KO mice along with functional abnormalities in the HPC (Sarnyai et al. 2000). Activation of 5-HT1A receptors in the medial septum alters encoding and consolidation in a HPC-dependent memory task (Koenig et al. 2008). In addition, LSD facilitated learning of a brightness discrimination reversal problem (King et al. 1972, 1974). Evidence suggests that performance on HPC-dependent learning tasks is influenced by neurogenesis in the DG of the HPC (Van et al. 2002; Gould et al. 1999a, b; Nilsson et al. 1999; Shors et al. 2001, 2002). This was elegantly demonstrated by Shors et al. by treating animals with methylazoxymethanol acetate (MAM), an antimitotic agent which eradicates the progenitor cell population in the DG before testing mice on HPC-dependent and HPC-independent learning tasks (Shors et al. 2001, 2002). MAM-treated animals had significantly fewer BrdU+ cells in the SGZ but showed no impairment in the spatial navigation task (HPC-dependent) or delay eyeblink conditioning task (HPC-independent), demonstrating that the hippocampal progenitor cell population is not essential for these particular tasks (Shors et al. 2001, 2002). In contrast, MAM severely impaired performance on trace fear conditioning and trace eyeblink conditioning, providing evidence for the involvement of progenitor cells in the DG in trace classical conditioning. The present study investigated the role of PSOP through the 5-ht2a receptor on hippocampal neurogenesis and a HPC-dependent learning task, trace fear conditioning. The effects of single-dose injections of PSOP, the 5-HT2A agonist 25I-NBMeO and the 5-HT2A/C antagonist ketanserin on the survival and phenotypic fate of progenitor cells in the DG were assessed using immunofluorescence techniques. The effects of single doses of PSOP on trace fear conditioning were chosen for this study because it has previously been demonstrated to be a HPC-dependent learning paradigm. The present investigation demonstrates that PSOP produces alterations in hippocampal neurogenesis and in a HPC-dependent learning paradigm of cue-associated fear conditioning. To evaluate the effects of PSOP on HPC-dependent learning, an acute treatment of PSOP or ketanserin was administered prior to trace fear conditioning. During the acquisition of the conditioned response, there was a striking increase in the amount of time spent freezing during the presentation of the CS and during the trace period and immediate post-trace interval from trial 1 to trial 3. These data demonstrate that the association between the CS and US promoted freezing in anticipation of the shock as well as during the period after the shock. Notably, the acquisition of the conditioned response was not impaired by acute administration of PSOP or ketanserin. Regardless of the PSOP dose, mice displayed similar locomotor activity levels in the freeze monitor box during the habituation baseline exposure and during re-exposure to the same environment during the contextual fear conditioning test. As expected, mice froze substantially more during re-exposure to the same context after CS–US associations were formed compared to the habituation baseline, indicating that mice formed contextual fear conditioning regardless of their drug exposure. It is well known that contextual fear conditioning is a HPC-dependent learning task (Hirsh 1974; Kim and Fanselow 1992; McNish et al. 1997; Frohardt et al. 1999; Esclassan et al. 2009). The serotonergic system has been implicated in performance on the contextual fear conditioning task (Dai et al. 2008), and hippocampal neurogenesis is required for the expression of fear memory (Shors et al. 2001, 2002). The present investigation found that interaction with the 5-HT2A receptor does not impair contextual fear conditioning since no differences were observed between controls and mice treated with PSOP or ketanserin. Unlike the acquisition of the conditioned fear response, where drug had no significant effect on learning the association between cs, trace and shock (UCS), the extinction of the conditioned response was accelerated in mice treated with low doses of PSOP. This rapid reversal of fear conditioning was only observed with low-dose PSOP treatment and was not present with higher doses or with ketanserin. Thus, PSOP treatment does not alter acquisition of a conditioned fear response nor in remembering the link between the CS and UCS (contextual test), but low-dose PSOP facilitates extinction by disassociating the link between the CS, trace and the UCS (shock). Given that low doses of PSOP accelerated fear extinction, it is interesting to consider whether PSOP is blunting the emotional component of the fear memory which leads to rapid extinction. We observed that all mice freeze in response to each presentation of the shock during training and assume that for all mice regardless of the treatment, fear is evoked. In human studies, low doses of PSOP produce no differences in general well-being, emotional excitability, anxiety-depressiveness, plasma cortisol levels, heart rate, body temperature and blood pressure (Hasler et al. 2004). Taken together, we believe that the PSOP facilitation of fear extinction is not likely due to blunted emotion but instead caused by diminished neurogenesis and alterations in hippocampal neurotransmission. The molecular basis for creating the links between CS and UCS in the trace conditioning paradigm is not completely understood. clearly, synaptic plasticity in the HPC is critical for the acquisition of new associations (learning) and recall of those associations (memory). Brain-derived neurotrophic factor (BDNF) has been implicated in synaptic plasticity and memory processing (Kang et al. 1997; Pang et al. 2004; Tyler et al. 2002) through the modulation of synapse formation and dendritic spine growth in the HPC (Bamji et al. 2006; tyler and Pozzo-Miller 2001, 2003). Chronic administration of 5-HT agonists (including ssRIs) upregulates BDNF mRNA expression in the HPC (Nibuya et al. 1995, 1996). Evidence suggests that the 5-HT2A receptor is involved in the regulation of BDNF in the HPC (Vaidya et al. 1997). Specifically, DOI, a 5-HT2A/C receptor agonist, decreased BDNF mRNA expression in the granule cell layer of the DG, but not in the CA subfields of the HPC. Interestingly, the decrease in BDNF mRNA expression was blocked by the 5-HT2A receptor antagonist, but not the 5-HT2C receptor antagonist, implicating the 5-HT2A receptor in the regulation of BDNF expression (Vaidya et al. 1997). The process of forgetting or breaking synaptic links in HPC is even less understood. One possible explanation for the findings presented here is that single low doses of PSOP acting via the 5-HT2A receptors on HPC neurons inhibit BDNF expression and thereby decrease synaptic growth and neurogenesis. The data reported demonstrate that the administration of PSOP produced a biphasic response in hippocampal neurogenesis; a low dose (0.1 mg/kg) resulted in a trend toward increased neurogenesis, whereas the high dose of PSOP significantly decreased the formation of new neurons measured 2 weeks after drug exposure. In addition, all doses of the potent 5-HT2A receptor agonist 25I-NBMeO and the 5-HT2A/C receptor antagonist ketanserin decreased hippocampal neurogenesis. A range of doses of ketanserin (1–5 mg/kg) administered within 4 h of killing has been reported to decrease the number of BrdU+ cells in the DG, indicating a reduction in cell proliferation (Banasr et al. 2004; Jha et al. 2008). The present study extends these findings by demonstrating that single doses of ketanserin decreased the number of BrdU+ and BrdU/NeuN+ cells 2 weeks after drug administration, indicating a reduction in both progenitor cell survival and formation of new neurons after exposure to a single dose of the 5-HT2A/C antagonist. Using positron emission tomography (PET), Vollenweider et al. established that PSOP-induced schizophrenia, like psychosis, in humans is completely blocked by the 5-HT2A antagonist ketanserin, demonstrating that PSOP produces psychotropic effects mainly via 5-HT2A receptor activation (Vollenweider et al. 1998). However, PSOP administration decreases [11C]raclopride receptor binding potential in the basal ganglia, which is indicative of increased DA levels (Vollenweider et al. 1999). Additionally, the D2 antagonist haloperidol attenuates the psychotomimetic effects of PSOP, clearly demonstrating that the DA system is involved in PSOP-induced psychotomimesis (Vollenweider et al. 1999). Interestingly, increases in DA disrupt fear extinction (Willick and Kokkinidis 1995; Borowski and Kokkinidis 1998); therefore, it is plausible that DA may contribute to PSOP facilitating the extinction of the fear response. Morrow and colleagues demonstrated that DAergic neurons which project to the medial prefrontal cortex (PFC) are critical in fear extinction and reduced rates of extinction are observed after 6-hydroxydopamine lesions to the PFC reduced DA levels to 13 % of control (Morrow et al. 1999). Furthermore, the activation of 5-HT2A receptors in the medial PFC increases extracellular glutamate levels (Aghajanian and Marek 1999), thereby affecting subcortical neurotransmission and increasing the activity of DA neurons in the ventral tegmental area (VTA), resulting in increased DA transmission in mesocortical and mesostriatal regions (Vazquez-Borsetti et al. 2009). Since drugs that increase DA bioavailability are involved in fear extinction, it is plausible that PSOP is facilitating fear extinction through an interaction between 5-HT and DA neurotransmitter systems in PFC, amygdala and HPC. To summarize, the data reported in the present investigation demonstrate that PSOP at low doses facilitates extinction of a HPC-dependent classically conditioned fear response. low dose of PSOP was also associated with a trend toward an increase, or no change, in hippocampal neurogenesis compared to vehicle treatment. In contrast, higher doses of PSOP (or of the 5-HT2A/C antagonist ketanserin) significantly depressed neurogenesis, and these doses had no impact on extinction of the conditioned fear response. Although previous studies have reported that ablation of hippocampal neurogenesis with a potent chemotherapeutic agent impaired acquisition of HPC-dependent fear conditioning (Shors et al. 2001, 2002), the present study did not reveal impaired acquisition of the trace fear conditioning response, likely due to modest inhibition of neurogenesis with the range of PSOP doses used. Importantly, studies of the effects of ablation of hippocampal neurogenesis focused on acquisition of the response and did not address extinction of a previously learned conditioned fear response as was done here. It is possible that the effect of low-dose PSOP on hippocampal neurogenesis, which was minimal, may not be the critical mechanism for forgetting or erasing the link between the noxious stimulus and the conditioned stimulus. PSOP clearly interacts with 5-HT2A receptors in other regions of brain known to mediate the emotion of fear such as amygdala (Ledoux 2003). However, one cannot invoke reduction in the fear emotion by PSOP because the acquisition of the conditioned fear response was not affected by PSOP administration at any dose. A final caveat is that PSOP is not a pure 5-HT2A agonist and may interact with other 5-HT receptor subtypes. In conclusion, low-dose PSOP which acts primarily on the 5-HT2A receptor facilitates extinction of a conditioned fear response and raises the possibility of targeting the 5-HT2A receptor to treat conditions where a previously neutral set of stimuli are associated with noxious, or life-threatening events, such as post-traumatic stress disorder.